Ross Welford’s new novel, his fourth, returns to favourite themes: time, time travel, family. 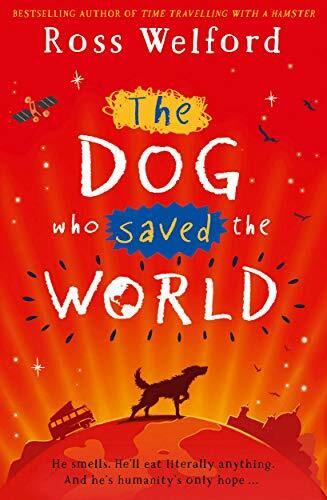 The Dog Who Saved the World combines a fantastical plot, relying on an ingenious manipulation of the laws of quantum physics, with a traditional and warm-hearted adventure full of friendship, growing understanding, and family love. Georgie lives in Whitley Bay with her dad, brother Clem and dad’s girlfriend, Jessica. Mum died some years earlier. Georgie is unconvinced about Jessica’s role in their lives, and it’s unfortunate that her allergy to dogs means that Georgie’s beloved mongrel Mister Mash has to live in a nearby dogs’ home. It’s while walking Mr Mash on the beach with her best friend Ramzy Rahman that Georgie meets Dr Emilia Pretorius and all their lives – indeed the future of the whole world – changes forever. As scientists go, Dr Pretorius is firmly in the crazy/crazy haired tradition of Doc Brown – an eccentric genius with a somewhat cavalier attitude to the personal safety of others. She’s built an extraordinary VR machine which has the ability to transport people into the probable future and just needs some willing assistants to help her try it out. The plot allows for lots of very funny moments, as well as some that are really quite frightening, and the tension builds when a terrible disease breaks out, one that is spread by dogs and deadly to humans. The ability to time travel into the future suddenly becomes more than a game. Welford controls his plots with real skill and there are moment of high drama, comedy and tragedy as, with the help of Mister Mash, Georgie sets out to save the world. He’s confident enough to allow Georgie to meet a version of her future self, and to learn from a conversation the two of them have. Genuine emotions are always at the centre of the action, however wild it gets, and no matter what is going on around them, we trust his characters who are as warm and realistic as they come.